Using CodeTwo Exchange Rules Pro, you can finally take full control over the entire company email flow. It allows administrators to set up automatic server rules which manage email traffic centrally on server. CodeTwo Exchange Rules Pro can control and filter the content of all your corporate emails, remove confidential information you not wish to spread out through your company mail. 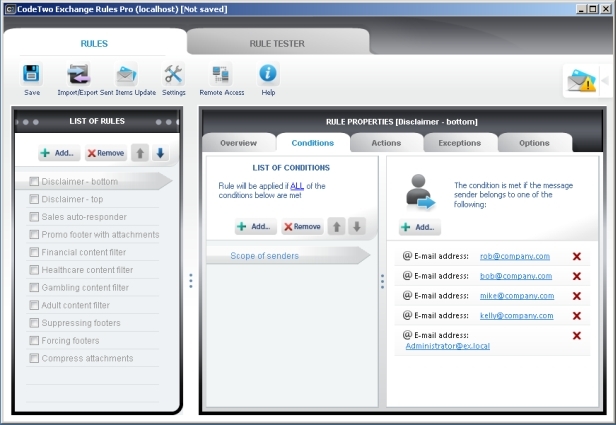 It can also forward all messages that fulfill specific criteria to selected email addresses; auto-respond to emails sent to recipients unable to reply by themselves; block, compress and archive specified attachments added to Exchange Server mail; add signatures and disclaimers and adapt your emails to international email regulations by fulfilling the international messaging standards. Link exchange software to improve link popularity and google pagerank. Qweas is providing links to CodeTwo Exchange Rules Pro 1.2.0 as a courtesy, and makes no representations regarding CodeTwo Exchange Rules Pro or any other applications or any information related thereto. Any questions, complaints or claims regarding this application CodeTwo Exchange Rules Pro 1.2.0 must be directed to the appropriate software vendor. You may click the publisher link of CodeTwo Exchange Rules Pro on the top of this page to get more details about the vendor.